The Samsung HMX-Q10 Camcorder is an ultra compact, high-definition camcorder which is easy enough for teenagers to use and available at a price you’ll like! For under $190, you can get your hands on this Samsung video recorder and keep your budding movie director happy. This video recorder is really user friendly. To turn it on, all you have to do is open the LCD screen. To access playback mode, simply twist the screen as you open it. To recharge this camera, you simply hook it up to the USB port on your computer. This takes away the hassle of batteries! You can move it between hands and even turn it upside down thanks to the SwitchGrip design. This is based on an inbuilt G-magentic sensor, which instantly works out which hand is holding it and knows when it is turned around. This provides a greater variety of filming opportunities. It uses BSI CMOS technology to minimize image noise and distortion. So if your teenager is recording at a dimly lit party or in other low light conditions, you can be sure of quality film. Other great features include one-button operation, an intuitive touchscreen interface that has drag and scroll functionality, and 10x optical zoom. The OIS Duo feature ensures steady film, even if you are on the move. 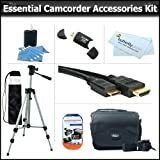 Buying the camera accessory kit for your teen as well as the camcorder itself is a great idea because it teaches him from a young age to care for his video recorder. The tripod is a particularly good extra accessory because it opens up different photo opportunities – perfect for those family group shots! This Samsung video camera may not be the cheapest one on the market, but it is definitely a great investment. We highly recommend this model for a teenager who is developing an interest in movie making and is going to appreciate what it has to offer. This camera was ridiculously easy to use, light weight, fit perfectly in my hand, the quality of the video was wonderful and the zoom was outstanding. This camera is a very nice, affordable, light weight, and easy to use device. I wouldn’t say that the camera’s full HD capability is to its fullest potential but it’s definitely worth the price, especially if you need a camera for family events and at home movies. I’d highly recommend this to anybody. Use it in either hand – or both!